Italy has to be my all time favourite destination, but this only happened a year after I got married. Until then, my excursions overseas had not once included Europe. I had been to England, the United States, the Middle East, the Far East and Australia, but never to Europe. My parents decided we needed some culture and sent us on honeymoon to Switzerland and Italy. We spent time in Florence, Rome, Bologna and Milan and I vowed I would go back someday and that I would learn to speak Italian. My Italian is basic and I aim to be fluent by the end of next year. Dave and I went back to Italy in 2010 and spent most of our time in Umbria, which included visiting Assisi. I got to experience their fresh produce markets and as we had a self catering unit for part of our time there, I could cook. 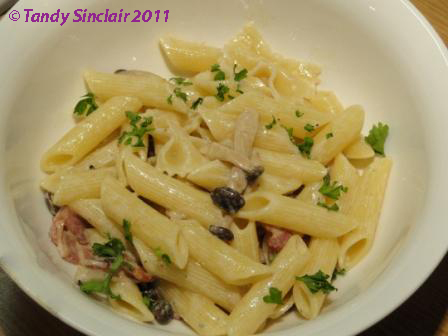 It is the smells and sights and tastes of Italy that visit my kitchen the most often, with a regular Tandy Tuesday meal of pasta – cooked the way an Italian would, simply and quickly. This mushroom and Gorgonzola pasta fits the bill completely. Mmm all my favourite ingredients together! Trips to Italy… I’m ready for a trip back myself. Pasta like this… I don’t even have to wait. Thanks for sharing with Presto Pasta Nights. My husband and son are big fans of these types of cheese. I am sure they would love this dish! am drooling ! but alas its salad for me right now ! too much over-indulgence ! Does Woolies stock beech mushrooms now? Pete would love your pasta but sadly I don’t enjoy gorgonzola.